The Etowah Stove (E2) is the first stove to use dual burner technology (DBT). By designing a stove with a burner inside a larger burner we created the ability to achieve the maximum boil time with extended burn time using the least amount of fuel possible. The E2 doesn't just boil water, you can actually cookup to 35 minutes using two ounces of denatured alcohol. When the outer burner on this ultralight stove is ignited it starts warming your food and preheating the fuel in the inner burner. The alcohol in the inner burner is gasified and builds pressure like a small rocket engine. The gaseous alcohol moves through the small jets of the inner burner to produce a steady cooking fire resulting in burn times of up to 35 minutes. 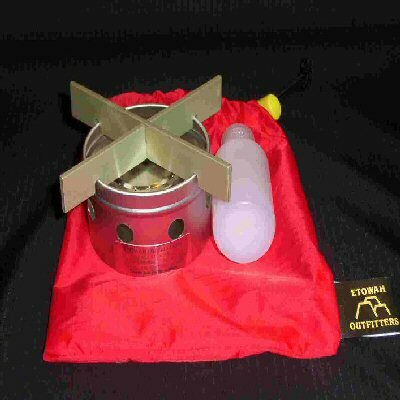 Sturdy, light weight (less than 6 ounces), inexpensive, this backpacking stove has been the choice of many a through hiker on the AT and other trails.